Handel's most famous and most often performed work is the oratorio <i>Messiah</i>, composed in 1741 and first performed in Dublin in 1742. Many individual numbers within the work have become independently familiar. As it comes to us in the twenty-first century, <i>Messiah</i> is unusual in several respects. Its text suggest that it is a sacred work, but it has enjoyed a substantial life as concert fare. A north German in the service of the British crown, Handel's oratorios were symbols of the (protestant) Church of England and its stature in British society. 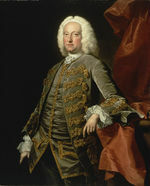 Dublin, which we know today as the capital of Eire (Ireland), had a substantial Anglo-Irish community in Handel's time. As it comes to us in the twenty-first century, <i>Messiah</i> is unusual in several respects. Its text suggest that it is a sacred work, but it has enjoyed a substantial life as concert fare. 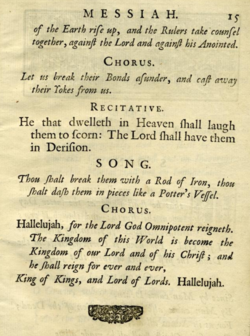 A north German in the service of the British crown, Handel's oratorios were symbols of the (protestant) Church of England and its stature in British society. 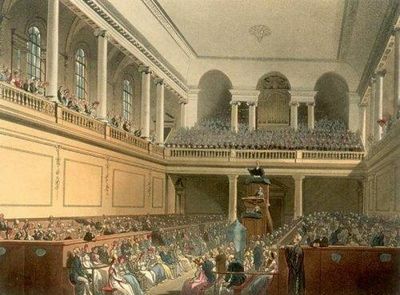 Dublin, which we know today as the capital of Eire (Ireland), had a substantial Anglo-Irish community in Handel's time and had strong cultural ties to London. Handel in an engraving by John Faber (1749) after painting by Thomas Hudson (1748). As it comes to us in the twenty-first century, Messiah is unusual in several respects. Its text suggest that it is a sacred work, but it has enjoyed a substantial life as concert fare. A north German in the service of the British crown, Handel's oratorios were symbols of the (protestant) Church of England and its stature in British society. Dublin, which we know today as the capital of Eire (Ireland), had a substantial Anglo-Irish community in Handel's time and had strong cultural ties to London. Handel's famous oratorio Messiah comes down to us as the best known and most widely performed of his compositions. Its fame rests of many factors--its gestation under favorable social circumstances in his life, its versatility and easy availability in ours. Overriding these extraneous factors is the virtue of the music itself: majestic and contrite by turns, carefully balanced throughout, and within the capabilities of diligent amateurs. This website provides copious performing materials for Messiah, with substantial background information concerning the rubrics on which these materials are based. Messiah is especially noted for its choruses. The most famous one is the Halleluia chorus that ends Part Two. The choruses are noted for their imitative vocal entries, which contribute to cascades of contrapuntal complexity as various groups of instruments highlight particular passages or counter vocal entries with musically independent passages. 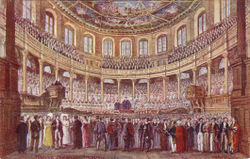 Performances of Messiah remained popular in England throughout the eighteenth and nineteenth centuries. For the first few generations they attracted the nobility but over time they attracted greater and greater throngs of people--singers as well as audiences. The Crystal Palace performance of 1884 seems to represent the peak of this phenomenon. 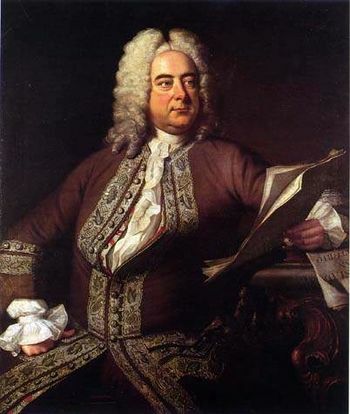 In the case of Messiah, the number of sources surviving from Handel's own time is fewer than the number of documented productions. [Nos. 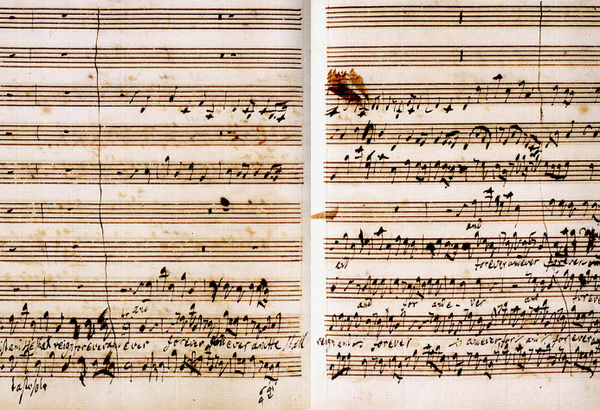 1,2] Discrepancies are first noted between Handel's autograph (summer 1741) and the libretto for the first public performance (April 1742). [Nos. 3-6] Librettos map changes from year to year, but the music for all the Covent Garden performances issues largely from one manuscript source. [No. 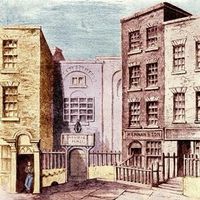 7] While it is known that Handel's himself participated in performances at the Foundling Hospital from 1754 onward, only the performing parts survive. [No. 8] Handel's conducting score is a valuable source for mapping changes in his thinking and documenting his own idea of a best version. [No. 9] The 1761 manuscript by James Matthews is regarded as contemporary with Handel's own versions because Matthews sang in multiple productions of the work. 2 Bassi and Tutti bassi: In a context of strings only, Handel’s bassi were cellos and double basses (violini. In a string-and-wind context, bassi parts could include bassoons: the cues “with bassoon” and “without bassoon” (con or senza fagotto) are the only clues to shifts in the accompanying instruments. Tutti bassi has the overall intent of requiring all available instruments of the bass register, but its instructional value is relative, not absolute. 3 Oboe scoring: Oboe parts and cures are absent in the autograph and other manuscripts of the 1740s, but their use is well documented for the Foundling Hospital performance of the 1750s and may have been used prior to written indications. Parts for oboes are preserved in the Coke Collection (at the Foundling House) and in a manuscript at King’s College, Cambridge, dating from the last quarter of the eighteenth century. 4 Brasses: Clear evidence of the use of trumpets with timpani becomes firmer in the 1750s. Overall usage clearly varied from place to place. 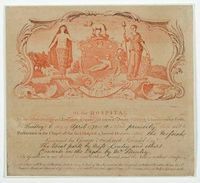 Oboes, horns, and kettledrums (timpani) were all used at the Foundling Hospital performance of the 1750s. Two oboes and one bassoon, with horns, trumpets, and drums in unspecified numbers, played with a string orchestra of 24 at Salisburg Cathedral in 1752. A Foundling Hospital performance in 1754 involved four oboes, four bassoons, two trumpets, two horns, a pair of kettledrums, and a string section of 24. It is consistent with these reports that the Foundling Hospital and Matthews manuscripts provide the clearest indications of what the oboes played. Over the course of 22 years, the MuseData Messiah project is benefited from the contributions of many people. The original editions was by Nicholas McGegan, John Roberts, and Eleanor Selfridge-Field, with encoding by Frances Bennion and Edmunc Correia Jr. 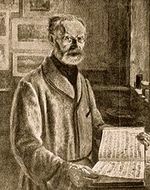 The introduction of the Arnold continuo figuration and preparation of the short scores (2003) are contribution by Walter B. Hewlett, who also developed all of the software used for preparation and management of the score and parts. This wiki site has been developed by Craig Stuart Sapp and Eleanor Selfridge-Field. Valuable insights and advice have been given in recent years by Don Anthony, Graydon Beeks, Ilias Chrissochoidis, John Phillips, and several others.